My previous post discussed what ports are, where they can be found on FreeBSD and what the files of which a port is composed of look like. This post will now detail how to use ports to build software on FreeBSD (the other BSDs have ports trees that work somewhat similar but are not identical. There are important differences!). 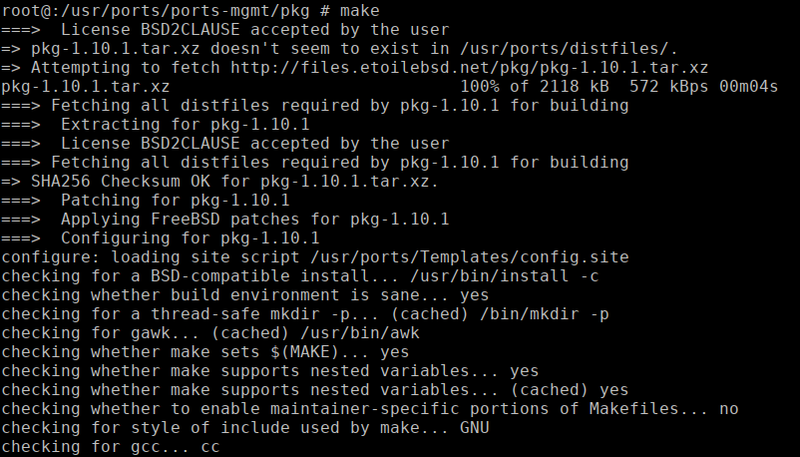 The ports system works hand in hand with FreeBSD’s package manager Pkg. It makes little difference if some software on your machine was installed via a package or directly from ports – packages are in fact actually built from ports! Still it is not really recommended to mix packages and ports. In past times it was strongly discouraged. Things have changed since then. I’ve done it a lot – and mostly got away with it. Don’t rely on it, though, especially if you’re new to the whole topic. Feel free to do it on a test system and be completely happy – or face subtle and annoying breakage. You cannot know up front. What’s the deal here? Modern software is a complex thing. Most programs rely on other programs or external libraries. A lot of programs can be configured at run time in certain ways. There are however decisions about program functionality that have to be made at compile time. The ports system allows you to build software with compile-time options other than the default. Pre-compiled packages have no chance to know that you choose to deactivate an option when you built a library yourself that they make use of. They assume that this feature is present (it was available on the system the package was built on after all!). And what can one poor program do in that case? Crash, explode, malfunction… A lot of things. And then there’s the problem of mixing versions which can lead to all kinds of fun. If you stick with either ports or packages, you always have a consistent system with versions that are known to play together well (as long as the maintainers do their job well – we’re all humans and errors do occur). Just keep that in mind when thinking about mixing programs installed from packages and ports on one system. You can do that. But it doesn’t mean you should. Enabling more options is generally safer than removing ones set by default. It can still have consequences. This is Unix though. Do whatever you see fit – and claim the responsibility. Your choice. Building a software from ports is extremely easy. Go to the directory of a port and type make. Yes, that’s all! Let’s assume the port has no unsatisfied dependencies. The ports system will then check to see if the source code tarball is present in /usr/ports/distfiles. If it isn’t, it will automatically download it. Then it extracts the source code, prepares everything for the compilation and compiles it. On my fresh example system I build the Pkg manager from ports first – it’s needed for every other port anyway. Once everything has finished I get my shell back. That’s it, Pkg is now installed. We’re basically done with that port. However there’s still the “work” directory left over from the building process. 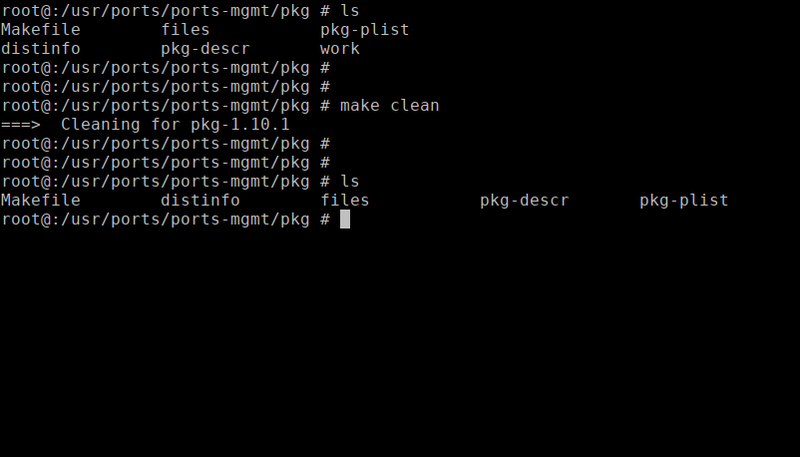 To tidy up our port’s directory we can issue make clean. On to a just slightly more complex example. I want to build and install an old version of the LUA interpreter which depends on another port, libedit. Of course I could build devel/libedit first and then lang/lua51. In that case it wouldn’t be so bad. But if you think of larger programs with hundreds of dependencies that approach would be a nightmare. So what to do about it? Well, nothing actually. The ports system takes care of it automatically! Just have it build LUA and it will figure out that it has to build the dependency first. The parameters to make that we used above are called make targets, BTW, and can be combined. 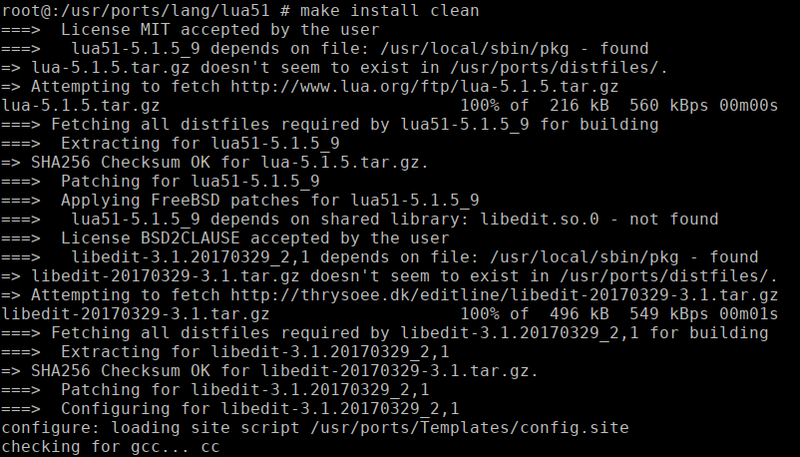 That means it’s perfectly fine to issue make install clean together as you can see in the picture above. The clean make target is also applied to all ports that were built as a dependency for the current port. Things like this make ports very convenient to use. If you type make checksum for example, all targets up to and including that one will run (that is config, fetch and checksum in that case). Running just make without any target will assume the default target which is equivalent to make build. 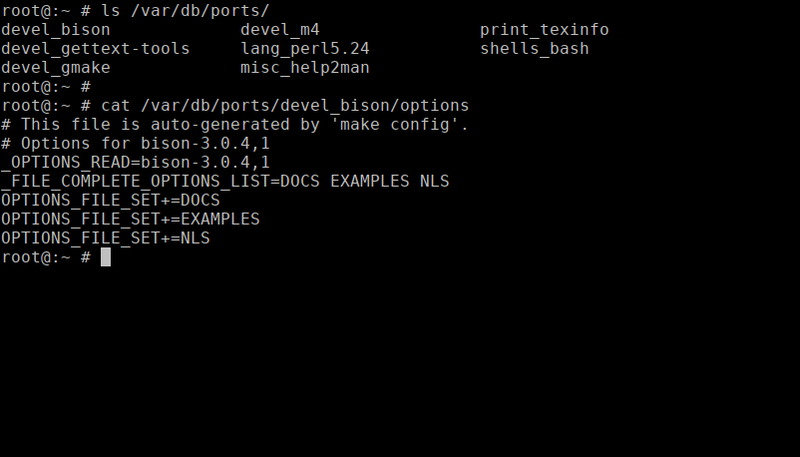 The port ports-mgmt/dialog4ports is fetched and installed. It’s so small that you might miss it but it’s quite important. It’s needed to display the menu in the picture above which lets you set various options for the port. You can now e.g. choose to not install the documentation if you’re short on space on a small or embedded system (sure, you wouldn’t actually compile on such a system, but that’s only an example, right?). If you don’t want BASH to support any foreign languages, deselect NLS. In case you feel that BASH’s built-in help is useless (did you ever issue the help command when you ran BASH? ), you can cut that feature. Things like that. If you see the option configuration for a port the first time, you see the default configuration. In general it’s a good idea to leave options alone if you’re in doubt what they do (do a little research if you have the time). Of course you’re also free to experiment with them. It’s your system. Once you’re happy, accept your selection and the source tarball is being fetched, extracted, etc. You know the score. But what’s that? 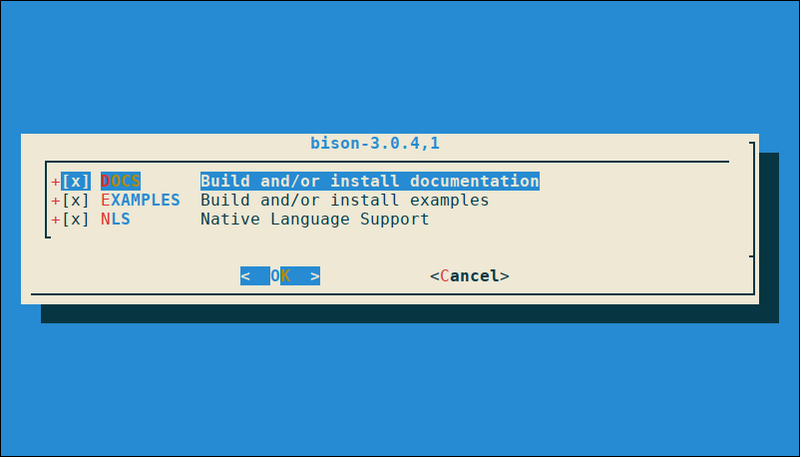 Another configuration menu (for bison)? 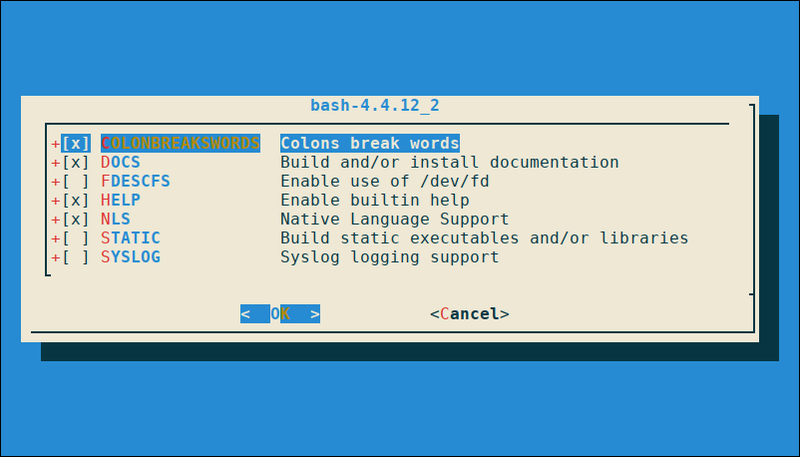 And another (m4) and another (texinfo), etc… It’s 8 menus for a rather basic program like BASH! And worse: The building process will run and build dependencies and when a port with options is reached, the process is interrupted and prompts the user. Now imagine you’re building a whole graphical desktop like MATE… Currently even the basic desktop would build no less that 338 dependency packages on a fresh system! And there’s quite a few ports on the list which build rather heavy software that takes it’s time compiling. It would totally make sense to let it build over night or at least not require you to keep staring at the screen, waiting for the next options selection to confirm, right? Exactly that’s why recursive operations are supported by the ports system. The standard make target that was implicitly run to open the options dialog is make config. The recursive option which would run the same on each and every port that’s listed as a dependency for the current port is make config-recursive. If you want to build MATE as mentioned in the previous example, that would start a true marathon of options for you to configure. However it’s still a lot better to be able to do this up front so that the build process can run uninterruptedly afterwards. Oh, and don’t be surprised if you went through it all only to find that still another configuration dialog pops up later! Why? Most likely you enabled an option on some package that made it depend on another package that’s not a dependency by default. 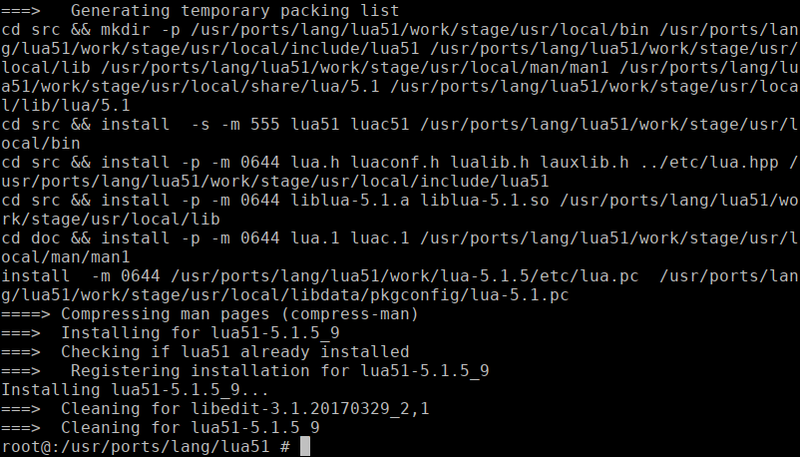 And that package may need to have its options configured, too. So if you changed any options it makes sense to run make config-recursive again until no more new option dialog windows are displayed! 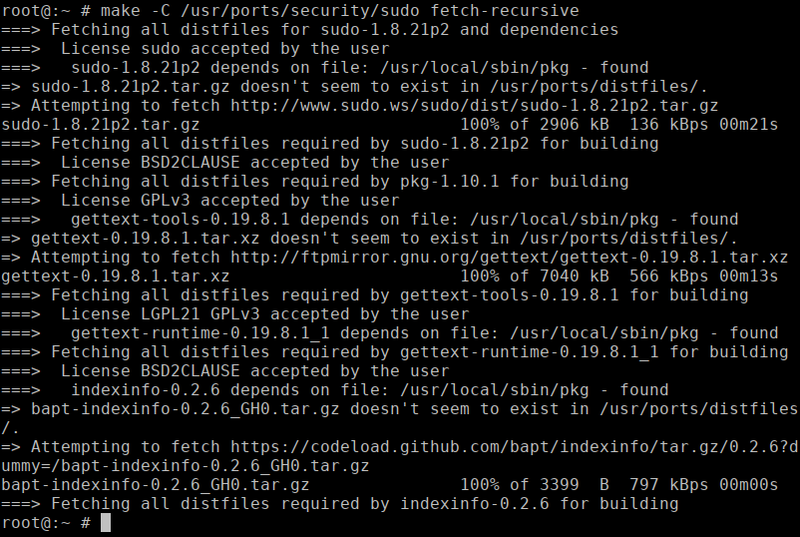 You can also do make fetch-recursive to fetch the distfiles for the current port and all dependencies. Again: Keep in mind that enabling more options may lead to new dependencies. If you want to make sure that you have all the distfiles, you might want to run make fetch-recursive again after changing ports options. Wonder where the all the options are saved? They are stored in text files in /var/db/ports/category_portname. But there’s no need to edit or delete them; if you want to get rid of them, there’s make rmconfig to do that. Also make rmconfig-recursive exists if you feel like blowing away a huge amount of them. 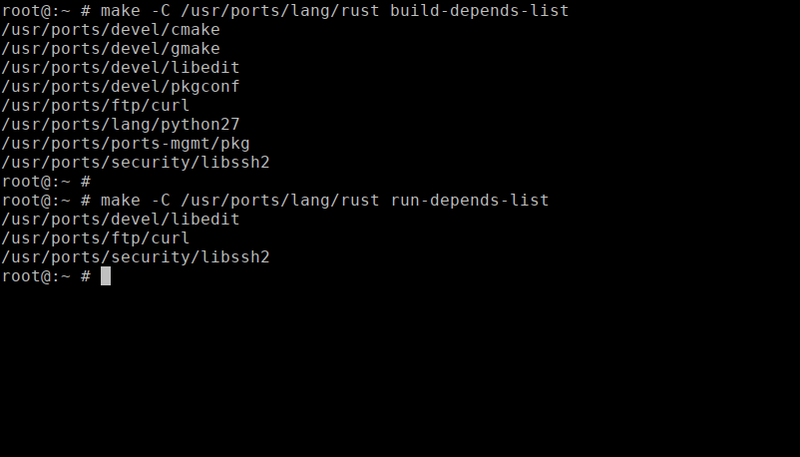 Another thing that comes in handy is make build-depends-list which will show you a list of ports that will be built as build dependencies for your current port. If you want to see the runtime dependencies you would use make run-depends-list. And then there’s also make all-depends-list which will show you each and every port that would be installed if you chose to build the current port. You should also know that you can deinstall a port by using make deinstall. Yes, it is also possible to remove the package using pkg delete but that will lead to a problem. 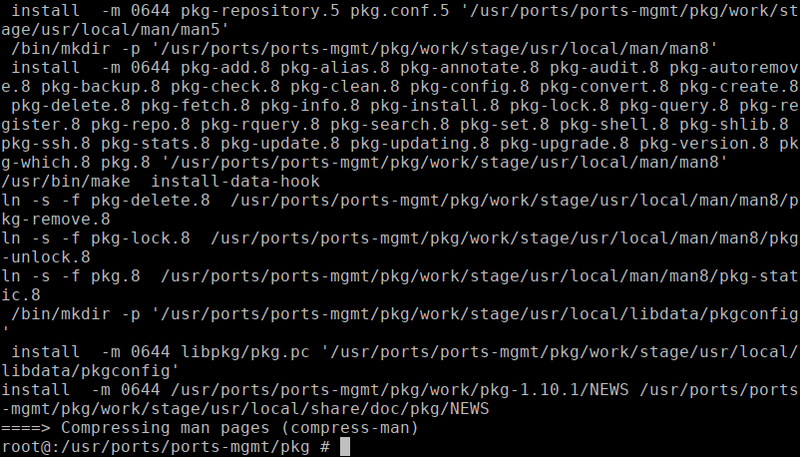 The ports infrastructure keeps track of installed ports separately and Pkg does not know anything about this. So even if your package is removed, the Ports infrastructure will insist that it is still installed and there’s something very wrong with your system! Now what to do if you have that case? Use make reinstall to install the package again even though ports thinks that it’s already installed. To be honest, there’s quite a bit more to ports than I could cover here. You may want to man 7 ports to see what other targets are available and what they do. Also we haven’t even touched how to keep your system updated when using ports! The ports infrastructure is a great means of installing customized programs on your system. It’s quite easy to use as you’ve seen. But things can be made even easier – which is why there are helper tools available. I will write a follow-up article covering those (not the next one, though). But for now enjoy all of those new possibilities with software on your FreeBSD machines!